Carrying the largest payload of both guided and unguided weapons in the Air Force inventory, the multi-mission B-1 is the backbone of America's long-range bomber force. It can rapidly deliver massive quantities of precision and non-precision weapons against any adversary, anywhere in the world, at any time. The B-1B's blended wing/body configuration, variable-geometry wings and turbofan afterburning engines, combine to provide long range, maneuverability and high speed while enhancing survivability. Forward wing settings are used for takeoff, landings, air refueling and in some high-altitude weapons employment scenarios. Aft wing sweep settings – the main combat configuration -- are typically used during high subsonic and supersonic flight, enhancing the B-1B's maneuverability in the low- and high-altitude regimes. The B-1B's speed and superior handling characteristics allow it to seamlessly integrate in mixed force packages. These capabilities, when combined with its substantial payload, excellent radar targeting system, long loiter time and survivability, make the B-1B a key element of any joint/composite strike force. The B-1 weapon system is capable of creating a multitude of far-reaching effects across the battlefield. The B-1 is a highly versatile, multi-mission weapon system. 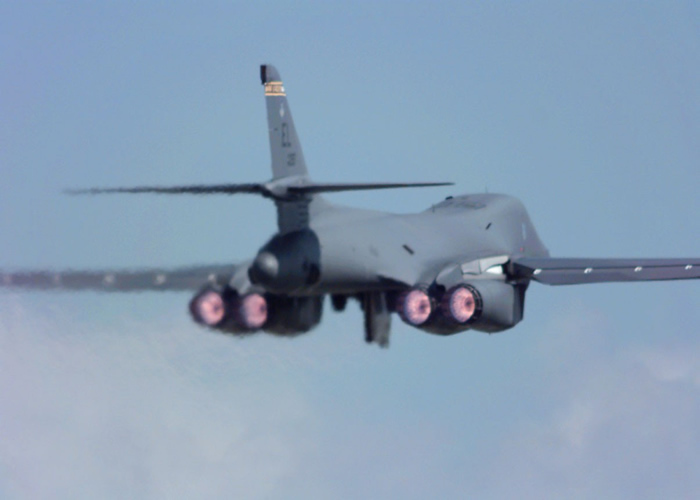 The B-1B's offensive avionics system includes high-resolution synthetic aperture radar, capable of tracking, targeting and engaging moving vehicles as well as self-targeting and terrain-following modes. In addition, an extremely accurate Global Positioning System- aided Inertial Navigation System enable aircrews to autonomously navigate globally, without the aid of ground-based navigation aids as well as engage targets with a high level of precision. The recent addition of Combat Track II radios permit an interim secure beyond line of sight data link capability until LINK-16 is integrated on the aircraft. In a time sensitive targeting environment, the aircrew can receive targeting data from the Combined Air Operations Center over CT II, then update mission data in the offensive avionics system to strike emerging targets rapidly and efficiently. This capability was effectively demonstrated during operations Enduring Freedom and Iraqi Freedom. 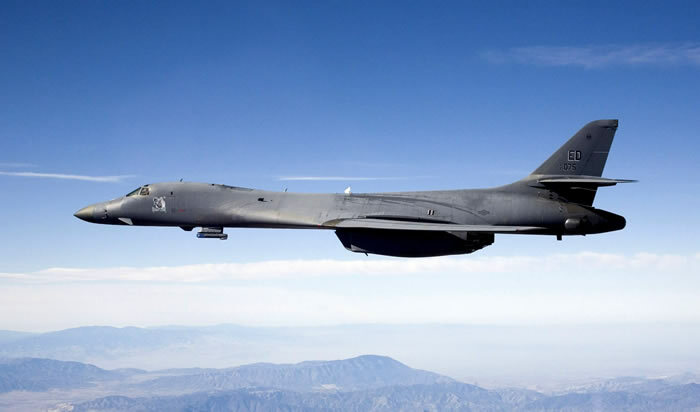 The B-1B's self-protection electronic jamming equipment, radar warning receiver (ALQ-161) and expendable countermeasures (chaff and flare) system complements its low-radar cross-section to form an integrated, robust onboard defense system that supports penetration of hostile airspace. The ALQ-161 electronic countermeasures system detects and identifies the full spectrum of adversary threat emitters then applies the appropriate jamming technique either automatically or through operator manual inputs. Chaff and flares are employed against radar and infrared threat systems. B-1 capabilities are being enhanced through the Conventional Mission Upgrade Program. This program has already improved lethality by adding the ability to carry up to 30 cluster munitions (CBU-87, -89, -97), a Global Positioning System receiver, an improved weapons interface that allows the carriage of guided weapons (GBU-31, Joint Direct Attack Munitions) and advanced secure radios (ARC-210, KY-100). Survivability is enhanced through the addition of the ALE-50 Towed Decoy System which decoys advanced radar guided surface-to-air and air-to-air missile systems. The current stage of CMUP (Block E) is adding vastly improved avionics computers which allow the employment of additional advanced guided precision and non-precision weapons: 30 Wind-Corrected Munitions Dispensers (CBU-103, -104, -105 WCMD), 12 Joint Standoff Weapons (AGM-154 JSOW) and 24 precision Joint Air-to-Surface Standoff Missile (AGM-158 JASSM). 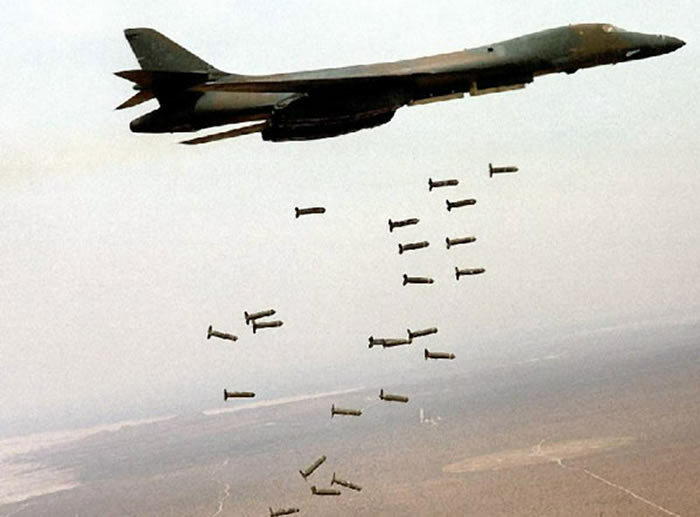 A Block E modified B-1 will be able to carry and employ a vast mix of weapons (a different type of weapon in each bay, such as 10 CBU-103 WCMDs in one bay, eight GBU-31 JDAMs in another and eight AGM-158 in the last). The B-1 is also the threshold platform for the extended range version of the JASSM. These modifications significantly increase B-1 combat capability. Future planned modifications build on this foundation provided by the new avionics computers. Radar sustainability and capability upgrades will provide a more reliable system in addition to an ultra high-resolution capability that will include automatic target recognition features. The addition of LINK-16 will allow the B-1 to operate in the integrated battlefield of the future. Cockpit modifications will relieve reliability problems and increase aircrew situational awareness and provide an integrated flow of information. These modifications enhance the already capable B-1 weapon system and provide the combatant commander a conventional workhorse. The B-1A was initially developed in the 1970s as a replacement for the B-52. 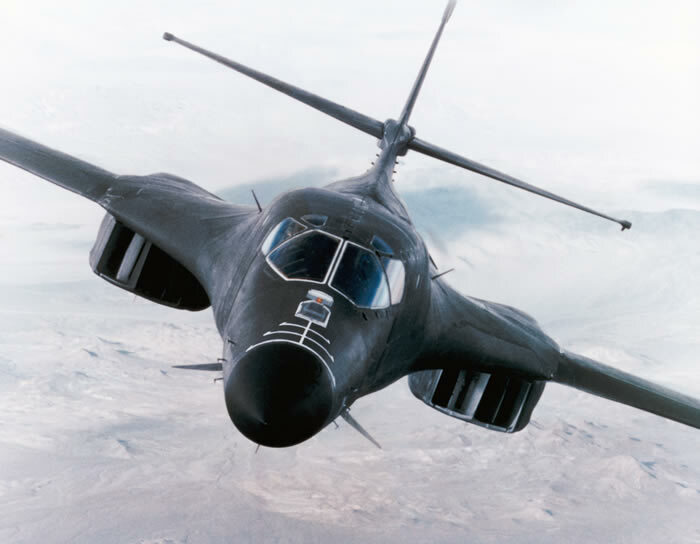 Four prototypes of this long-range, high speed (Mach 2.2) strategic bomber were developed and tested in the 1970s, but the program was canceled in 1977 before going into production. Flight testing continued through 1981. The B-1B is an improved variant initiated by the Reagan administration in 1981. Major changes included the addition of additional structure to increase payload by 74,000 pounds, an improved radar and reduction of the radar cross section by an order of magnitude. The inlet was extensively modified as part of this RCS reduction, necessitating a reduction in maximum speed to Mach 1.2. The B-1B holds 43 world records for speed, payload, range, and time of climb. The National Aeronautic Association recognized the B-1B for completing one of the 10 most memorable record flights for 1994. 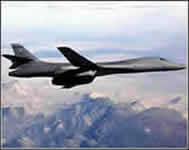 The B-1B was first used in combat in support of operations against Iraq during Operation Desert Fox in December 1998. In 1999, six B-1s were used in Operation Allied Force, delivering more than 20 percent of the total ordnance while flying less than 2 percent of the combat sorties. 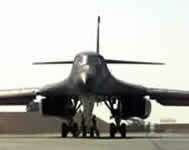 Eight B-1s were deployed in support of Operation Enduring Freedom. 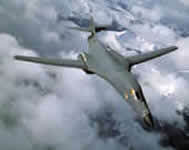 B-1s dropped nearly 40 percent of the total tonnage during the first six months of OEF. This included nearly 3,900 JDAMs, or 67 percent of the total. All of this was accomplished while maintaining an impressive 79 percent mission capable rate. Armament: 24 GBU-31 GPS-aided JDAM (both Mk-84 general purpose bombs and BLU-109 penetrating bombs) or 24 Mk-84 2,000-pound general purpose bombs; 8 Mk-85 naval mines; 84 Mk-82 500-pound general purpose bombs; 84 Mk-62 500-pound naval mines; 30 CBU-87, -89, -97 cluster munitions. Upon Block E completion, additional weapons available will be 30 CBU-103/104/105 WCMD, 24 AGM-158 JASSMs or 12 AGM-154 JSOWs.